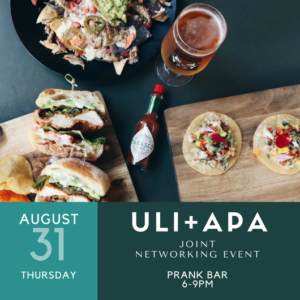 Join us for an exclusive networking event connecting ULI and APA members with a common ground to meet, mingle, and collaborate. Spark strong, collaborative partnerships by sharing each others’ passion and experience! This month, highlighting ULI’s Young Leaders Group (YLG) and APA’s Young Planners Group (YPG), learn about each organization’s most recent endeavors and community outreach. Attendees will have the opportunity to meet and network with ULI and APA members who have a diverse range in background and field experience. Learn how everyone makes an impact with their work and how ULI and APA can support in enriching communities. To support ULI’s and APA’s most recent community project, raffle tickets will be sold at the event and the winning ticket will receive a gift bag. While enjoying Prank Bar’s Food+Beverage menu, be sure to have great company and great music to start your evening!